Our Henna powder is sourced from reliable suppliers and subjected to exacting quality tests. Our in-house experts test each batch of powder for its freshness, color, and longevity. Our guaranteed fresh, triple sifted Henna powder is one of the finest combinations of various pure Himalayan herbs such as Brahmi, Amla, Bhringraj, Shikakai, etc. which are used to make hair voluminous, shiny, healthy and strong. It imparts modern and excellent hair colour, while being an eco-friendly and natural product at the same time. 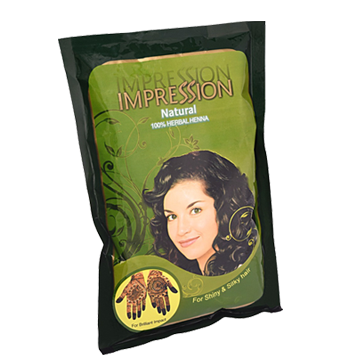 Why Impression 100% Natural Herbal Henna? Take out the Impression Natural Henna powder in a plastic bowl. Be careful while adding water as too much water will make the mixture very light. Make the paste so thick that it can be easily applied on hair. Wrap your hair with a plastic wrapper. Keep it overnight or for 3-4 hours if you want a darker tinge or wash your hair after 1-2 hours. Rinse using warm water. (a light application of conditioner maybe required to continue getting the henna out of your hair while rinsing it). 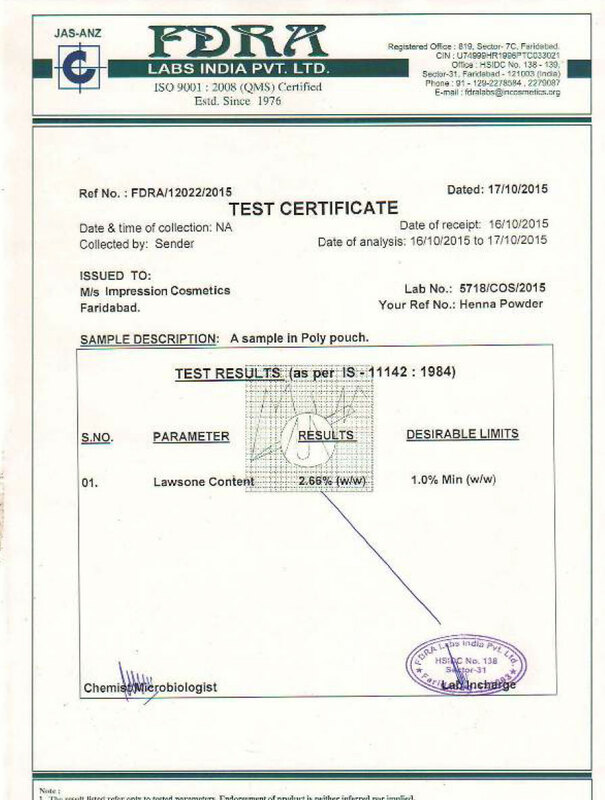 We at Impression cosmetics provide a laboratory certificate clearly stating the lawsonia content in our Henna to our customers. We ensure that the Lawsonia content in our Henna is never less than 2.5%.